Imagine, you follow a narrow pathway along the shadowed forest floor and are led into in a lush, moss-laden garden accented with sculptures and wildflowers. The sun is beginning to fade behind the canopy as fairy lights illuminate the humid mid-summer evening. Although star-crossed at times, your lover and yourself have decided to spend a night at the theater amongst good cheer and better wine. If this sounds like a Shakespearean scene, you’re not far from the truth. Four times a summer Door Shakespeare in Bailey’s Harbor hosts a unique pre-show Wine Night event in the Garden at Björklunden. 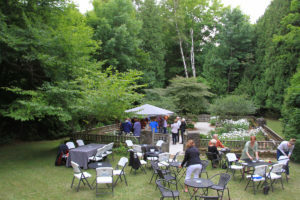 Located just beyond the outdoor stage, patrons are welcomed into the garden to mingle, sip wine and feast on local food from Thyme Catering. Post-dinner dessert and coffee are presented just before the main show is to begin seating, making for a full evening of dining and live theatrical performance. Wine is the main attraction of the event, and the variety and number of bottles reflect this. 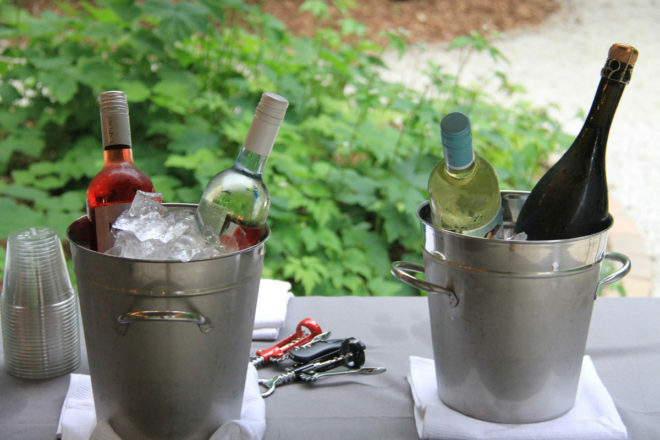 The wine offerings range from various white and red blends, to sweet prosecco and rosé. In fact, no two bottles being poured are the same. 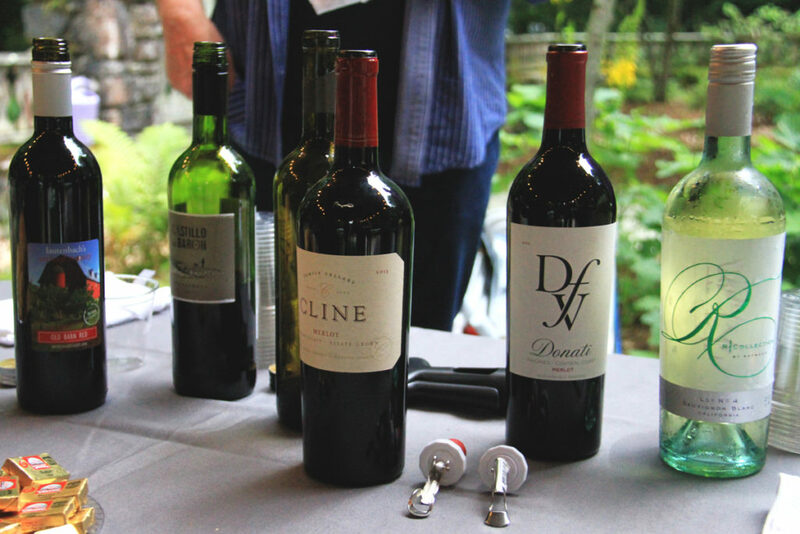 “A generous theater patron provides the wine for each event and includes a huge variety of bottles they think would be enjoyed by most wine drinkers,” said managing director and event host, Amy Ensign. The food naturally plays second fiddle, but barely. “In the earlier years we used to go more with appetizer offerings, but now we provide a full meal, which seems to be a better way to go,” said Amy. 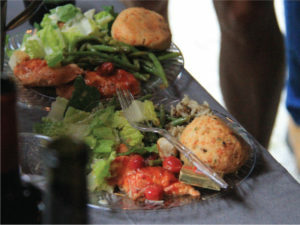 The most recent menu by Thyme Cuisine features a classic Caesar salad with cheddar chive biscuits, green beans amandine, wild rice, Door County cherry BBQ chicken and powdered sugar lemon squares for dessert. The menu is updated for each wine night and focuses on highlighting seasonal ingredients. Due to the outdoor setting, the elements may become a factor, as they did on the night of my visit. Yet as clouds moved in, umbrellas were hoisted, more corks were popped and the crowd continued on with the merriment seemingly unperturbed. The thunder and rolling dark clouds only heightened the drama of the evening, with more to come during the performance of Much Ado About Nothing. Two more Wine Nights remain in the 2018 season; the first is on Monday, August 6 and second on Tuesday August, 14. Check the weather, come on an empty stomach and study up on your Shakespeare for a magical evening in the garden.